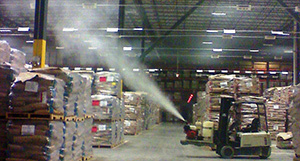 Western Fumigation has the experience to address critical situations in food processing facilities … safely, effectively, and with minimal disruption to your operation or production schedules. You can count on us for fast, thorough elimination of pest infestations in bakeries, breweries, grain and flour mills … as well as stored products and animal feeds. We have designed highly effective treatments for processing facilities and equipment, systems, silos and bins, containers and warehouses. These include the use of safe, reliable, fast-acting treatments that are ideal for use in food storage and processing facilities. Our solutions are designed to save you time and money. Western’s Food Safety program enables us to offer the highest levels of professionalism and peace of mind to customers who are concerned about food safety and security…. because we can verify both our program and the caliber of people who provide our services. Our exceptionally high standards in hiring practices include full medical examinations, personal and immigration background checks… plus drug and -alcohol testing. Verification includes documentation of compliance with all government regulations, technical and safety training, licensing, and the exclusive use of certified applicators.